Dancing dominates a good part of my life and I have been dancing and teaching dance for almost 30 years. My current favorites include cajun, zydeco, clogging, contra and Sword Dancing, but I still love English, Scandinavian, tap, Morris, and Swing. I perform with a number of dance groups including Cutting Edge (English Sword team in Washington DC) and the now defunct PedAntics. This is a foot percussion group located in the DC metropolitan area. Until I moved to DC I danced with a group called the Wild Goose Chase Cloggers (an Appalachian clogging group). 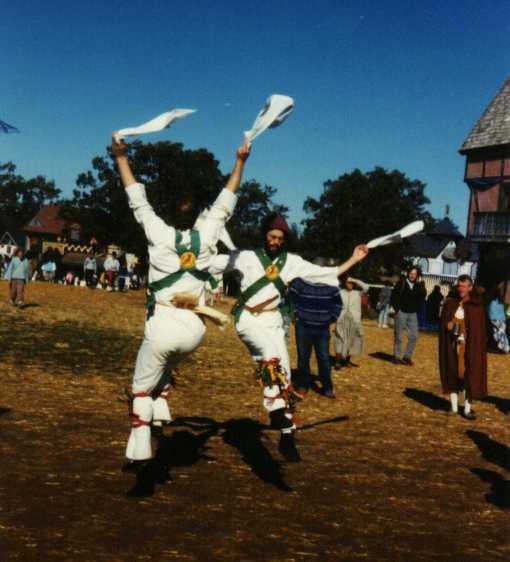 On the traditional side I have and still intermitantly do dance with the Minnesota Traditional Morris Dancers (English Cotswold Morris), and several sword teams that I have directed including Vorpal Sword, an English rapper sword team, and Asworded Nuts, an English longsword group. In the past I have been a part of Hungarian, International, and English performing groups as well. I also teach and call contra dances, and hopefully I will get some of the dances I have written up on this site soon. Some of the dances I have composed have been published in a set of three books called (collectively) Contrabutions. These books, published with Carol Ormand and Peter Stix (two callers from this area) include some great dances. If you are interested in getting a copy of the most recent book, drop me an Email. They are also available through CDSS. I call with a number of bands. You can get booking information for them below in the Band-Link section. You can hear many of these at the Tapestry Folk Dance Center in Minneapolis. There is lots of great dancing there and a very inviting atmosphere. Contratopia is one of the newest bands in the area. 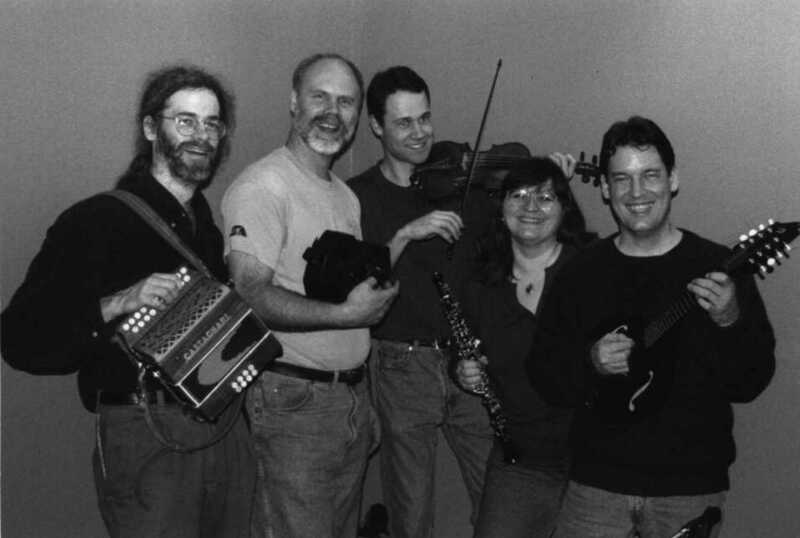 It features Eric Sessions on fiddle, John Goodin on Mandolin and Guitar, Pat O'Loughlin on banjo and concertina, and Patrice Pakiz on keyboard, oboe and percussion. Contratopia now have three CDs!! For information on these contact John Goodin. John can also be contacted for booking information for the band. Here are some cuts from a local recording at a gig in Iowa. The first is a collection of original reels composed by John Goodin. The second is a slower tune written by Eric Sessions. The cuts are a few minutes long each. Whistling Britches, French Sneakers, and Maggie in the Rain. We will be touring again in November 2009. Check out their web site for the latest details. The Tapestry Folk Dance Center. The Midwest Cajun and Zydeco scene. The Twin Cities Swing Scene page. The Cedar Cultural Center. Lots of concerts and dances. Cafe Accordion Orchestra. Featuring couple dances from around the world. The Senders. Probably the best swing band in town! The Wild Goose Chase Cloggers. A local Appalachian clogging team I used to dance with. Morris Teams in Minnesota. A non-official compilation of Morris Dancing teams in Minneosta. A large number of Links to Argentine Tango resources. A list of Morris WWW pages. A page about dances in the D.C. Area. Contra Dance listing throughout the US. A National Contra Dance listing. Very nice job by Ted Crane. CDSS. The Country Dance and Song Society. A great place to find stuff related to English and American dance and song. I have also written a few contra dances. Many of these are published in three books that I co-wrote with Peter Stix and Carol Ormand. Since these are hard to find, I have decided to start putting a few of my dances up on the web. Since this takes time, I wouldn't expect too many of these dances to appear anytime soon. Nevertheless, it does give me a reason to keep writing them, becuase then at least the web will know about them. If you like them, give me a shout sometime. Happy dancing!